Iberia’s A-330 sporting the new corporate image. MADRID,Spain–October 15th. Iberia Airlines launched its new image and livery. Since 1978 the airline had used its prior image, a white fuselage, three accent stripes (red,orange and yellow) and the stylized “IB” in the tail. The new corporate image is modern and it is expected to reflect the new Iberia (with British Airways both carriers are owned by International Airlines Group). In 2013 Iberia suspeded its services to Havana and San Juan. The airline operates from Madrid to Los Angeles, Miami, Chicago, Boston, New York-JFK, Mexico City, Guatemala City, San Salvador, San Jose, Panama City and the most important cities of South America. This entry was posted in Airline Alliances, Airlines, Chile, Colombia, Costa Rica, Cuba, Latin American Airports, Spain and tagged Iberia, Livery, Logo, Spain. LA HABANA, Cuba– On April 18th, the brand new Cubana de Aviacion Antonov An-158 arrived at Jose Marti International Airport in Havana. The first of six Ukranian airliners the Cuban flag carrier has purchased for its flights to the Caribbean and Central America. “Now Cubana doesn’t have to lease airliners that might be subject to the Embargo Law applied by the United States of America against Cuba”, declared Ricardo Santillan, the Vicepresident of Cuba’s Civil Aviation Institute. The first destinations will be Santiago de Cuba, Cancun, Managua, San Jose, Guatemala City and Santo Domingo. The An-158 is a regional jet aircraft designed by the Ukrainian Antonov Design Bureau and produced by Ukraine’s Kiev Aviation Plant AVIANT. Antonov has also outsourced production to Russia’s Voronezh Aircraft Production Association. Development of the plane was started in the 1990s, and the maiden flight of the first version (An-148) took place on December 2004 The plane completed its certification programme on February 2007. 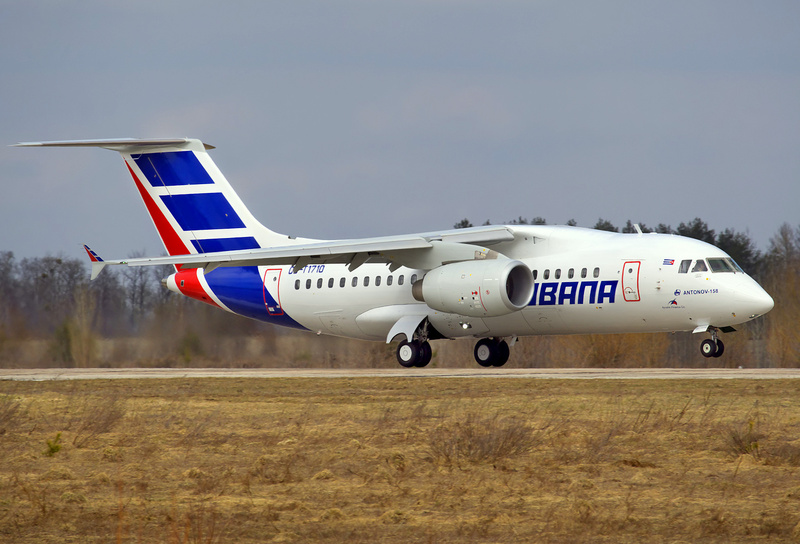 The An-158 has a maximum range of 2,500–4,400 kilometers has a stretched fuselage, compared to the An-148, and has a capacity for 99 passengers. Cubana de Aviacion operates routes to 16 destinations in the Americas, Caribbean and Europe. Cubana Airlines can not lease American or European airliners, only Russians. The newest airliner to enter the flag carrier’s the fleet, the modern Ukrainian Antonov An-158. This entry was posted in Airlines, Cuba, Latin American Airlines, Latin American Flag Carriers and tagged Antonov An-158, Cuba, Cubana Airlines, Cubana de Aviacion.